Oftentimes gutters are something that you don’t really think about until it’s too late. You might put off cleaning them or replacing them until the worst happens – they crack, leak, or simply break altogether. If you live in Tijeras, New Mexico, or a surrounding area, turn to ABC Seamless of Albuquerque before that happens and have the problem resolved right away. We’ve proudly served residents of the area since 1989, and specialize in installing premium, custom-fabricated products including siding and gutter systems. Our seamless steel gutters are measured and cut right on site, in order to guarantee that we match the exact dimensions of your home. 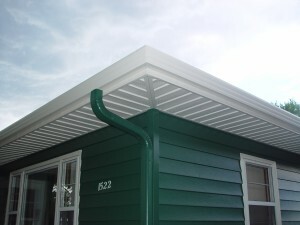 This allows us to create a seamless steel gutter that will minimize that opportunity for leaks to develop. Additionally, our gutters are 30 percent wider than traditional systems, which allows them to collect more rainfall and direct it effectively away from your home. If you are ready to upgrade or replace your existing gutters in Tijeras, NM, or the surrounding areas, contact ABC Seamless of Albuquerque today. We offer convenient financing options for those who qualify as well as an exceptional warranty on all of our products.